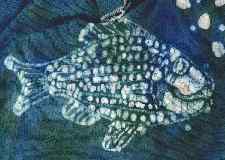 Some of my favorite works are batik--actually faux-batik, in that I do only one round of waxing, and then dye with several colors at once. 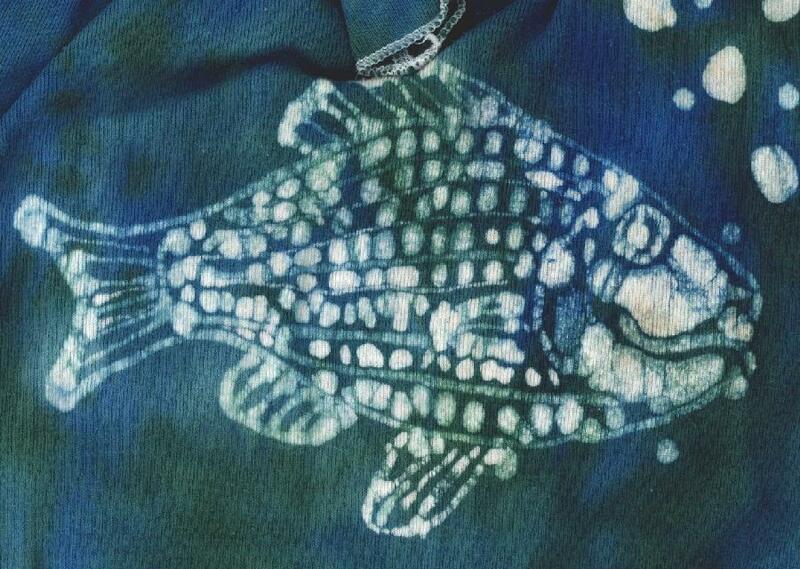 This is the first detail I've scanned in for these pages, a fish from a snap crotch t-shirt that I batiked for my younger son, when he was a toddler. To see the fabric in much greater detail (it's far more beautiful when you can see the details), click on the two detail pictures. 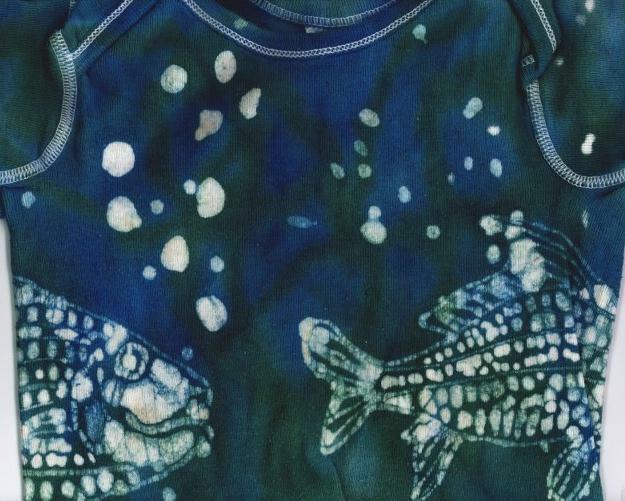 The shirt has two fish, one on each side--one with its head on the front and its tail on the back, and the other reversed. The garment as a whole is a mixture of blends of cerulean blue and a green made by mixing cerulean blue or turquoise with lemon yellow. There are random "air" bubbles from wax drips at various points on the garment. The two fish are two different real species, but I've forgotten their names. How I made it... See How to Batik for instructions. I just drew with a tjanting and melted mixed beeswax and paraffin. (Key hint: batiking failed for me when I first tried it; I finally learned this was because the melted wax was not hot enough. Getting an electric frying pan solved that problem and made it easy.) 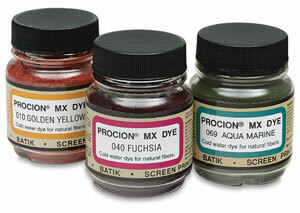 Days later, I dyed them with Procion MX type dyes (see recipe) and washed them out in cold water. Getting the wax out was a bear. Boiling was a pain and didn't work - I wasn't using soap. Ironing took forever and left traces of wax, unsuitable for kids' clothes, which I want to tumble dry. Dry cleaning didn't remove any wax - the cleaners around here don't use the chemical that dissolves wax. Finally I paid a dry cleaner to remove all the wax with steam! Now I find that boiling works fine if I add soap. I've used dish detergent and Dr. Bronner's liquid castile soap. It is necessary to weight the garments down below the surface of the water while the wax cools and solidifies. 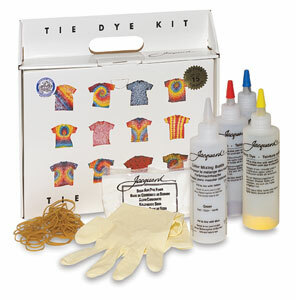 Only after the wax is solid is it safe to remove the fabric without getting the wax all over it again. On the next page is another one-piece garment I made for my younger son, Peter, with two different hand-drawn batiked cats. Keep going and you'll find more examples of my work, and ultimately instructions on dyeing and information on sources for materials and books. All of the pages on this site are copyright ©1998-2019 Paula E. Burch, Ph.D.